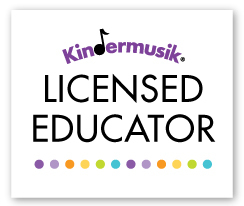 Lauren has been a music educator for over 15 years and a licensed Kindermusilk educator since July 2012. She began playing clarinet in middle school band and soon after began studies on saxophone and flute. Inspired by her band directors and private lesson instructors, Lauren majored in clarinet performance at Texas Tech University with the desire to have her own clarinet and saxophone studio. After graduating in 2002, she went on to pursue graduate studies in clarinet performance at The University of North Carolina at Greensboro. At UNCG, Lauren focused her performance studies on chamber music, specifically through her collaboration with the clarinet quartet, Una Voce. She also focused much of her studies on pedagogy, music education, and the social psychology of music. Upon earning her master’s degree in 2004, Lauren taught private students in Greensboro, High Point, and Cary, NC. She also performed in the pit orchestras all over central North Carolina, including Sanford’s own Temple Theatre. Lauren was also the bass clarinetist for the Fayetteville Symphony and a clarinetist in the Lee County Community Orchestra. From 2006-2011, Lauren lived in Clarksville, TN where she had a large studio of award-winning middle and high school students. She also formed the Iris Chamber Players and coordinated the Renaissance Chamber Series at The Renaissance Center, both in Dickson, TN. Lauren was also a tenor saxophonist for the Cumberland Jazz Project. She has been back in Sanford since 2011 and immediately began playing with the Lee County Community Orchestra and serving on their Board of Directors. Lauren organizes the annual Instrument Petting Zoo in October and the concert concessions for LCCO. She began Kindermusik with Lauren Winkens in July 2012 to bring music education to the youngest citizens of Lee County, NC. In 2013, she started Real Great Music, LLC and is excited to watch her Kindermusik program grow. Lauren is blessed to have her two children in her Kindermusik program and a loving husband who supports and encourages her crazy schedule! Amy joined us in Fall 2013 and is our baby and toddler class specialist. A Sanford native, she comes from a long line of family musicians and a rich history of music. She plays guitar, piano, and flute and is very active in her church choir. When she isn’t singing with our littlest friends, she is with her two daughters and husband.